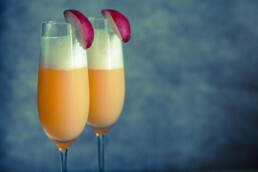 Add apple, peach and lemon juices to a champagne flute. Heat agave syrup (or simple syrup/honey) and stir in. Top off your amazing mocktail with sparkling water. To finish, wedge the apple slice on the rim.